Today I had the pleasure of attending a London Film Festival screening of “The Final Year”, a documentary by Greg Barker focusing on the last year of President Obama’s administration with a specific focus on foreign policy. Regular readers will know that foreign policy is not my area of expertise, and rarely discussed on this blog. I only know enough to recognise that I am not qualified to pass blanket judgment on diplomatic and foreign policy issues which are fiendishly complex, rely on tremendously detailed knowledge of foreign cultures and regimes, and often require unbearably difficult decisions to be made in fraught circumstances with competing political demands, imperfect information and no crystal ball to see the future. But it was difficult to watch the documentary and fail to conclude that the main protagonists – former Secretary of State John Kerry, United States ambassador to the United Nations Samantha Power and Deputy National Security Adviser Ben Rhodes – discharged their duties diligently and with honour. One may not have agreed with all that these individuals did or the political outlook which guided their actions while serving in the Obama administration, but if so these were mere policy differences, not alleged deficiencies of character or behaviour. It was also difficult to view the documentary and not feel a pang of shame at the composition and antics of the present administration, which even at its dubious best never seemed as functional as its predecessor, and which will certainly now struggle to attract talented, conscientious public servants given the scandals and negative publicity constantly roiling the White House. Human beings have a tendency to impugn motives and presume character defects in people in public life based on our political differences with them. If we disagreed with the policies of Barack Obama then he also conveniently happened to be a dangerous socialist interloper who simply doesn’t love America the way that you or I love America. And if we disagreed with Mitt Romney or John McCain it was because they were heartless, selfish individuals devoid of charity or empathy, not due to the fact that these conservatives simply saw a different pathway to achieving a just and prosperous society. This is not a new phenomenon. Republicans questioned the motives and character of Democrats in the Clinton administration; Democrats questioned the motives and character of Republicans in the Bush administration; Republicans had a very lucrative turn questioning the motives and character of Democrats in the Obama administration, and now everybody but the most partisan loyalists can be found expressing grave doubts about the motives character of many of those serving in the Trump administration. And historically speaking, many of these negative judgments have been unfair. Most staffers in any administration serve out of a sense of public duty with real respect for the offices which they hold, and to impugn their motives at a time in their lives when they are trying to do good is churlish, particularly when there is no evidence of malfeasance. But this time it feels different. Be it known or suspected acts of misconduct in office or the very public and unatoned-for personal failings of senior officials, the things we already know about less than nine months into the Trump administration should give us grave concern about the calibre of leadership in Washington, regardless of whether or not we agree with the general thrust of policy. A few weeks ago, the masterful Peggy Noonan (speechwriter to President Ronald Reagan and a personal hero of mine) wrote a particularly moving column for the Wall Street Journal. In it, she conjured a moment of pure escapist fantasy, an alternate reality where all of the dreadful things we know to be true about people in the Trump administration – from the president on downwards – turned out to be nothing more than silly misunderstandings. [..] This happened just before the Mnuchin story got cleared up. The Treasury secretary had not asked for a government plane to take him on his honeymoon. His request got all bollixed up in transmission, but there was a paper trail. It turned out he was waiting at the airport with his new wife when he saw a guy in Army fatigues comforting a young woman in a white and yellow dress. She was crying. Mr. Mnuchin sent over an aide to find out what’s wrong. The column continued in the same hopeful vein – Trump was shown to be unexpectedly humble and empathetic beneath his braggadocious facade, and at one point Hillary Clinton’s post-election book “What Happened” turned out not to be a self-indulgent, self-exculpatory exercise in blame-shifting but rather a sincere and thoughtful atonement for the collective sins of the American political establishment. It made me feel proud, like there’s hope for our political class. That is what I saw this week. I should note—this part is true—that I saw much of it while anesthetized for a minor surgical procedure. For an hour afterward, even knowing it was either a fantasy or a dream, I felt so . . . hopeful. Cheerful. Proud. I give it to you. It is impossible to read Peggy Noonan’s column without aching for a time when public service was a calling reserved for people of character and principle, even if that time exists only in our imaginations, false memories or old episodes of The West Wing. This is not to say that the Obama administration represented some high watermark of moral behaviour in office. Former Attorney General Eric Holder was less than truthful more than once in his testimony to Congress, while the IRS under senior executive Lois Lerner was found to be singling out conservative organisations for additional tax scrutiny and harassment. But even adjusting for anti-conservative bias in the media, the Obama administration comported itself with considerably more dignity than has thus far been shown by the constantly rotating cast of Trump officials. And it would take a significant change of trajectory, bordering on the miraculous, for this assessment to change. Is it really possible that in four or eight years’ time we will look back on the people who serve in the present administration, who now represent the federal government to its citizens and the United States of America to the world, and think of them as sincere, hardworking and well-intentioned (if sometimes flawed and mistaken) public servants? Is Rex Tillerson – a man who showed little interest in foreign policy beyond its applicability to the oil industry prior to his nomination as Secretary of State – presently losing sleep at night trying to implement a foreign policy vision that he sincerely believes will make America and the world safer and more prosperous, as John Kerry did? Are Trump’s other cabinet secretaries maintaining the dignity of their offices and the commitment to fiscal rectitude which is supposed to be a fundamental Republican selling point, or are they all behaving like former Health and Human Services Secretary Tom Price and current Treasury Secretary Steve Mnuchin, abusing their offices and the public trust by showering themselves with unnecessary perks on the public dime? And even if Trump apologists, knowing the administration to be deficient in these areas, are willing to sacrifice these qualities for the greater good of bringing down an establishment which ironically seems to be strangely ascendant within the current White House, are the benefits of this governmental shock therapy really worth the side-effects of employing such a motley group of charlatans and opportunists to follow in the footsteps of better men and women? 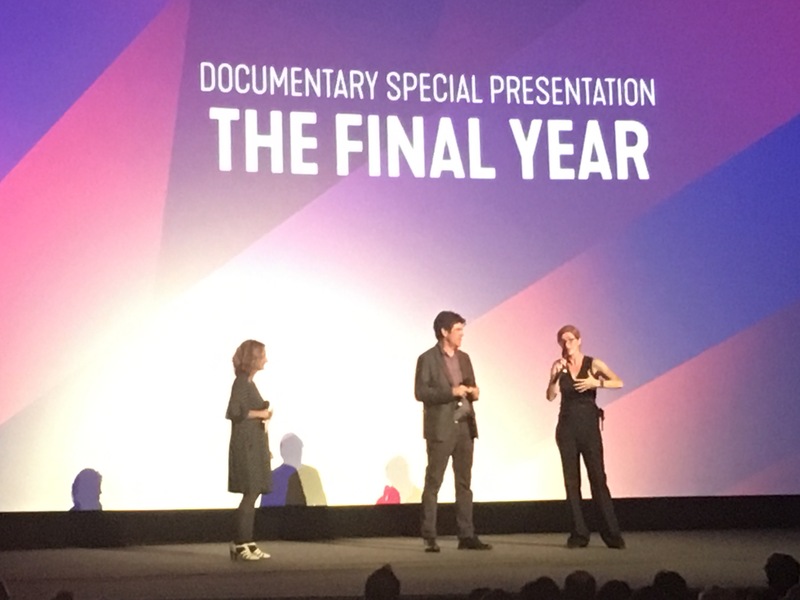 Watching “The Final Year” at the Odeon Leicester Square today, I could certainly understand how people might feel sceptical or even angry about some of John Kerry’s priorities as Secretary of State and those of his former boss, or be rubbed up the wrong way by the opinionated Ben Rhodes and Samantha Power. Theirs is a specific worldview with which not everybody agrees. But it is also evident that they are patriots one and all, serving the country that they love to the best of their abilities and in line with the values which they believe were twice vindicated by the election of Barack Obama as president. Based on what we know, it would certainly be very difficult to accuse any of these Obama administration alumni of being self-serving, superficial or corrupt in their duties. I hope that when the time comes to look back on the current presidency, we will be able to say the same of all those who presently serve in the Trump administration. I sincerely hope so, but I am not optimistic. The Final Year will be released in cinemas in the US & UK in January 2018. In a concerning report by the Herald Scotland, it transpires that the SNP government north of the border is attempting to create its own mini foreign policy, not aligned with nor cleared through the Foreign and Commonwealth Office in Westminster. More concerning still, the fact that the Foreign Office quite rightly asked the Scottish government to cease and desist from this irresponsible behaviour is being portrayed as the real scandal, rather than Nicola Sturgeon’s back-of-an-envelope attempt at statecraft. The Foreign Office in Westminster is demanding to vet Scottish Government dealings with other countries on human rights, according to correspondence seen by the Sunday Herald. The UK foreign minister, James Duddridge, has asked the Scottish international development minister, Humza Yousaf, to clear all his letters to foreign governments with the UK government before raising concerns about human rights infringements and other matters. The move has infuriated Yousaf. “It beggars belief that the Tories – who are in the midst of scrapping the Human Rights Act – want to vet the Scottish Government’s letters raising human rights concerns abroad,” he said. “I am proud of the SNP raising concerns about human rights without fear or favour – and certainly will take no lessons from the Tories on this,” he added. Yousaf wrote to Duddridge and the Malawian High Commission, Kena Mphonda, on December 16 2015 raising concerns about the arrest of two Malawian nationals, Cuthbert Kulemela and Kelvin Gonani, for alleged homosexual offences. Duddridge replied on January 7 2016, saying that following representations from the UK government, charges against the two men had been dropped. “You mention that you have written to the Malawian High Commissioner on this matter,” he wrote. There is no grey area or room for interpretation here – this was a completely irresponsible act on the part of the devolved Scottish government. Foreign and defence matters are reserved to the UK government and Westminster parliament as you would expect in any country even remotely based on the principle of subsidiarity. It is not the job of any of the devolved assemblies – in Wales, Scotland, Northern Ireland or indeed England, if there was one – to enter into sensitive diplomatic correspondence with other sovereign nations. Imagine for a moment that one day California or Texas decided to start acting as an independent agent on the world stage, raising all manner of issues with foreign governments, and maybe even negotiating their own trade deals or bilateral arrangements. The federal government in Washington, D.C. would rightly never tolerate such an arrangement, as it would undermine the very sovereignty and credibility of the United States. The same goes for Scotland. Whether the SNP government had a point is immaterial. In this case, the SNP and their buccaneering international development minister Humza Yousaf (again, a role which should not exist in a Scotland which remains part of the UK) are probably on the right side of the issue. Malawi has a very concerning record on LGBT rights and the persecution of individuals, and the concerns raised were valid. But being right on this one occasion does not validate the wholly offensive principle of Scotland creating its own mini foreign policy behind the UK’s back. In typical virtue-signalling SNP fashion, Yousaf tries to fold this issue into their pitched battle against the Heartless Evil Tories in Westminster, saying he will “take no lessons from the Tories” on human rights. But this isn’t about human rights. It is about the structure and proper running of our country. If we now establish the principle that self-regarding Scottish politicians can make interventions like this with foreign countries, what is to say that they cannot one day scupper a sensitive trade, security or intelligence negotiation by blundering onto the scene and undermining the UK’s position? Even if the Scottish government happens to be right, any differences of opinion on foreign policy matters should be discussed and settled behind the scenes, so that the UK government can speak with one voice. Anything else will see the UK mercilessly divided and conquered by our foreign negotiating partners. The Scottish people voted in 2014 to remain part of the United Kingdom on the understanding that certain additional domestic powers would be devolved from Westminster. Whether or not you believe that the UK government has delivered on those pledges, at no time was the idea of an alternative Scottish foreign policy raised for debate. There was no expectation that the Scottish government should be an independent actor on the world stage any more than the governor of Iowa or Texas can sign treaties with North Korea. But as with so many other matters, a repeat of instances like this can only be prevented if we decide once and for all what kind of country we want to live in, and how the various parts of it should work together. And that means holding a constitutional convention as soon as possible. Given the approaching EU referendum, some time shortly after 23 June would seem to be a good time. If we are to truly resolve the roiling questions about the future of the United Kingdom and our democracy and settle these issues for a generation or more, we need to collectively agree a fair and equitable devolution of powers to the four home nations on an equal basis. The question of whether England is treated as a home nation or a group of regions is of secondary importance, though this blog strongly believes that for true parity, England must be treated as a single entity just like Scotland. But this discussion must take place soon, within the wider context of a full constitutional convention. Such a convention would give us the opportunity to debate and agree which powers should properly reside at each level – the federal UK government in Westminster, the devolved assemblies in the home nations, and county and town councils. We can simultaneously reform our legislature, ideally making the House of Lords democratically elected and ejecting the Lords Spiritual so that Britain no longer ranks alongside Iran as the most prominent technical theocracy in the world. If this all seems ambitious and unlikely, then this is only a failure of our imagination. There is no good reason why we should not have such a debate (well, there is one reason – the future of the monarchy – which will be discussed in a future blog post). And as Pete North argues, why should we not be ambitious in terms of the future governance of our country? Do nothing, and we can be sure that more of these instances will occur in the future, with ambitious Scottish politicians looking to make a name for themselves and burnish their human rights, national security or trade credentials by taking advantage of our lack of a written constitution and designing their own far-reaching roles on the world stage, with no oversight and no accountability. Enough. No more SNP diplomacy by numbers. Whether they happen to be right or wrong on a given issue, for so long as Scotland is part of the United Kingdom, diplomacy and foreign policy should be a reserved matter for our shared government in Westminster and not hijacked by the Scottish nationalists. That is the settlement which the people of Scotland signed up for in the 2014 referendum, and that is what they should now get. Alan Johnson and Philip Hammond both clearly attend the same branch meeting of the Dewy-Eyed European Union Cheerleaders Association, because both politicians – one Labour and one Conservative – are both now peddling the same pathetic line to the media, namely the suggestion that Britain amicably leaving the European Union would be like “sticking two fingers up” at our allies and inviting some form of deserved retribution in return. In terms of our own borders, Britain is actually in the best possible position – in the EU, signed up to the Dublin Accord but outside Schengen. Thus economic migrants have to register in the EU country where they first arrive (thousands have been deported from Britain in the past 20 years for breaching this requirement), and a visa is still required for anyone outside the EU to enter this country. Furthermore, it was because Britain was part of the EU that David Blunkett was able to persuade Nicolas Sarkozy to, in effect, move Britain’s border from Dover to Calais. If Britain put two fingers up to the 27 other nations in the EU the first reaction of the French would undoubtedly be to end that arrangement, thereby ending the security barrier that that arrangement offers us. This was tremulous, scaremongering nonsense when the same idea was advanced by Conservative MP Mark Field, and it is tremulous, scaremongering nonsense when it comes out of the mouth of Alan Johnson, too, having been comprehensively refuted and debunked by many people, not least on this very blog. Meanwhile, Philip Hammond – who one might have expected to know and conduct himself better, given the fact that he currently serves as Foreign Secretary – echoed the same cheap catchphrase to MPs in Parliament. He says that if Britain votes to leave the EU “the mood of goodwill towards Britain will evaporate in an instant”. This is essentially an admission of incompetence by the Foreign Secretary. What Hammond is suggesting to us with this cheap attempt at scaremongering is that he has so mismanaged our relationships with key European allies, and so misled them as to the nature of British public sentiment toward the EU and the consequent possibility of Brexit, that our perfectly amicable and controlled departure would come as a complete shock to them. Furthermore, if Hammond’s words are to be taken seriously, it means that he has presided over the worst diplomatic failure in recent British history – namely the failure of a declared nuclear power, as well as a leading military, economic and cultural power, to command such respect on the world stage as might survive us leaving a supranational arrangement which we no longer believe works in our favour. Is that really what the Foreign Secretary wants to tell the British people? Europhiles and Remainers can’t decide whether Brussels is friend or frenemy; whether the other EU member states are dear friends who would be sorry to see us go, or bitter rivals who would seek to punish Britain for rejecting their vision of a politically unified Europe. And it is about time they made up their minds. Of course, the cynical pro-EU “Remain” campaign tries to have it both ways. When it suits them in their campaigning, the EU is a happy-go-lucky club of like-minded countries who frolic and trade with one another. But when that hopelessly naive, childlike view of Brussels is questioned by eurosceptics and Brexiteers, out comes the other portrait of a snarling, vicious EU which will ruthlessly destroy Britain if we continue to drag our feet or think about leaving. Good cop, bad cop. Europhiles will normally try the “good cop” routine first when engaging with undecided voters. But this tends to come unstuck as soon as eurosceptics and Brexiteers counter with their own positive vision of Britain restored as a sovereign democracy playing a full and engaged role in global trade and world affairs. Since the pro-EU crowd are unable to share their own repugnant vision of a politically integrated Europe for fear of scaring people away, they are instead forced to go negative, hence the rapid and disconcerting pivot from “See how nice the European Union is, and all the wonderful things it does for us” to “If we try to leave the EU, they’ll rough us up”. Truly, their position is less a serious argument about governance and diplomacy, and more the tortured thought process of a battered spouse trying to rationalise staying in an abusive relationship. In many ways, it is unsurprising that there is so much confusion over what would likely happen in the event that Britain declared our intention to leave the EU following a “Leave” vote in the referendum. Few journalists have taken the time to assimilate the information and share it with their readers, which then positively begs unscrupulous Remainers like Philip Hammond and Alan Johnson to exploit the public’s fear and ignorance. Negotiations undertaken after citation of the withdrawal clause of the Lisbon Treaty will be a matter of practical politics. Although the application of EU and international law is not a settled issue, especially in this as yet untested area, the notion that the EU would refuse to cooperate, or even seek to “punish” the UK in the event of secession – thereby clearly violating EU law as well as failing to comply with international law – is beyond the realm of realistic politics. Although Article 50 negotiations conducted under a framework of treaty law will be first and foremost a political matter, it is clear that lawyers will be consulted regarding the laws application. What we can be certain of is that – as Sir David Edward, the first British Judge of the European Court, has said – EU law requires all parties to negotiate in good faith and in a spirit of cooperation. Moreover, the Vienna Convention of the Law of Treaties obligates negotiators to act in “good faith” and “good faith” itself is an underlying principle of international law, and certainly a principle of WTO law. The EU negotiators must therefore endeavour to reduce trade restrictions in accordance with treaty provisions and, crucially, their actions are justiciable. If EU negotiators were to veer away from treaty provisions, or indeed if any other EU member sought to impose sanctions or restrict trade, the UK could opt to lodge a formal complaint with the European Court of Justice (ECJ), and block the discriminatory action. It must be remembered that during the Article 50 negotiations the UK remains a member of the EU and enjoys the full rights and privileges of membership. The Commission itself may be legally obliged to step in and begin infringement proceedings against the offending member state. It may amuse lazy political commentators to paint the hypothetical future Brexit negotiations as some kind of zero-sum game, trial of strength or fiendishly complex case study in Game Theory, but this would simply not be the case. The truth would be altogether more boring and pragmatic than the europhile naysayers would have us believe, with both sides obligated to negotiate with one another in good faith. Kelly is right to eschew the tub-thumping “they need us more than we need them!” kind of language as he builds his case, but nonetheless it is worth pointing out that in the event of Brexit negotiations being initiated, all national governments would come under huge and sustained pressure by their local business leaders and lobbyists to avoid taking any retaliatory or counter-retaliatory action which might lead to the throwing up of onerous new barriers to trade. Given the amount of money and reputational capital that many multinational companies are willing to spend lobbying and campaigning for a “Remain” vote, it is not unreasonable that they would make equally strong representations to the British and EU member state governments to ensure a smooth and orderly Brexit – one which this blog firmly believes is best accomplished by following a fully worked-through plan like Flexcit, in which we would minimise economic disruption from leaving the EU’s political union by maintaining our EFTA and EEA membership. Those people on the Remain side who seek to dumb down the argument and reduce the nuanced situation of Article 50 Brexit negotiations to a cartoonish “sticking two fingers up at Europe” / “get punished by France and Germany in response” are being deliberately misleading in attempt to distract from the paucity of their case. But worse than that, they are also subscribing to the fatalistic, anti-British mindset which states that our country – the fifth largest economy and one of the most consequential actors on the world stage – is actually nothing more than a minor, third-rate country, easily bullied by its peers. But remember: by peddling this nonsense, EU apologists like Philip Hammond and Alan Johnson are not merely demonstrating their lack of faith in Britain (particularly concerning coming from a Foreign Secretary). They also reveal their lack of respect for the intelligence of their fellow citizens, whom they lazily assume can be swayed and manipulated by their base scaremongering and dark warnings of EU reprisals. Jeremy Corbyn took to Facebook over the weekend to demand that Britain chart a new, more “independent” foreign policy. This came off the back of a speech that Corbyn had wanted to deliver last week blasting Britain’s close alliance with America, but was forced to postpone because of the Paris terror attacks. The third pillar of our vision for Britain is a different kind of foreign policy – based on a new and more independent relationship with the rest of the world. A relationship where war is a last resort. For the past 14 years, Britain has been at the centre of a succession of disastrous wars that have brought devastation to large parts of the wider Middle East. They have increased, not diminished, the threats to our own national security. Few would now seriously argue that Western interventions in Iraq and Libya did anything other than deplete our resources and further inflame the region. But Corbyn’s professed desire for a “more independent relationship with the rest of the world” is pure nonsense. Jeremy Corbyn does not want Britain to pursue a more “independent” foreign policy. He is simply unhappy with our existing foreign policy and allegiances – where Britain recognises the many shared mutual interests we have with the Anglosphere and other Western powers, and seeks to build on those natural alliances which inevitably form where there is such a close fit of culture, history and legal systems. If Jeremy Corbyn really wanted Britain to pursue a truly independent foreign policy, his first act as Labour leader would not have been to cravenly roll over and submit to the rabid europhiles within his party, who insisted that he follow their lead and slavishly promise to campaign for Britain to stay in the European Union come what may. This decision is all the more surprising given Corbyn’s subsequent willingness to enrage his own backbenchers – and even his shadow cabinet – on almost every other question, from air strikes on Syria to hiring controversial and divisive staff and flip-flopping on George Osborne’s fiscal charter. Clearly Jeremy Corbyn is happy walk his own path on nearly every policy other than the pressing question of Britain’s future sovereignty. How can Corbyn claim to want Britain to pursue an “independent” foreign policy when he has committed Britain to remaining in the EU and being part of the Common Foreign and Security Policy? How can Britain claim to be an independent diplomatic force when the EU’s High Representative for Foreign Affairs, Federica Mogherini, is more active and visible on the world stage than our own Foreign Secretary? You can argue the rights and wrongs of whether Britain should pool so much of our diplomatic clout into a single European voice – over which we exert only 1/28th of the influence. But the one thing you absolutely cannot do with a straight face is to call the resulting foreign policy an independent one. But of course Corbyn does not really want Britain to pursue a truly independent foreign policy. What he really means by this dog-whistle to Stop the War types and extremism sympathisers is that he wants Britain to specifically forsake the United States of America, and cease our friendship and co-operation with our closest ally in the world. Jeremy Corbyn doesn’t look at the special relationship between Britain and America and see an unparalleled alliance which spilled blood and treasure in defence of democracy twice in the last century, and whose embrace of the free market has pointed the way for other nations around the world to achieve prosperity. No, Jeremy Corbyn looks at the special relationship and sees Britain yoked against her will to the Great Satan – an awful, dystopian, capitalist war machine, economically and militarily subjugating the countries which Corbyn would much rather call his friends. He sees no good in the United States because his “friends” in Hamas, Stop the War and the far Left in general spend every waking hour ranting about just how evil and immoral America is. Yet on Europe, Corbyn is firm: Britain should remain a member of this relentlessly tightening political union come what may – regardless of David Cameron’s cosmetic renegotiation, and regardless of the direction the EU is heading in the future. The Labour leader succumbs to the same negative, pessimistic view of Britain’s capabilities and international stature as the other europhiles, believing that Britain is too pathetic and ineffectual to do what Australia and Canada manage to do every day – engage with the world as an independent nation. Jeremy Corbyn’s foreign policy simultaneously views Britain as being so weak and pathetic that our only pathway to influence on the world stage is to have the same sliver of influence over a common European Union foreign policy as tiny Malta or Slovenia, but also so potentially dangerous to the world that we must terminate the one alliance which has been the bedrock of our foreign policy since the second world war. It is a risible, childlike worldview – one which would be funny if only a Corbyn premiership would not see Britain giving moral and tangible succour to some of the most odious regimes in the world. Corbyn is right to point out our own moral failures in foreign policy, such as our close partnership with the brutal Saudi regime, working closely with that dictatorship in exchange for scraps of intelligence about the various terror plots that they are themselves funding and encouraging. But he undermines his own point by letting his actions and statements imply that there is any moral equivalence between regimes like Saudi Arabia and the United States. Corbyn, along with too much of ‘progressive opinion’, has a mistrust bordering on hatred for western powers. They do not just condemn the West for its crimes, which are frequent enough. They are ‘Occidentalists’, to use the jargon: people who see the West as the ‘root cause’ of all evil. Their ideology is in turn genuinely rootless. They have no feeling for the best traditions of their country, and their commitments to the victims of foreign oppression are shallow and insincere. They rightly condemn western support for Saudi Arabia. But if the Saudis were to become the West’s enemy tomorrow, their opposition would vanish like dew in the morning sun. Jeremy Corbyn and the left he comes from cannot campaign for office by saying what they really think or they would horrify the bulk of the population. They say enough to keep their ‘base’ happy, and then dodge and twist when they speak to the rest of us. Far from being authentic, Jeremy Corbyn is one of the most dishonest politicians you will see in your lifetime. If Jeremy Corbyn wants to be taken seriously as a straight-talking, honest politician he should admit that he has absolutely no desire for Britain to pursue an independent foreign policy – or an independent anything else, for that matter – and that all of this posturing is just his way of signalling to a certain audience that he disapproves of one country in particular. That’s a campaign slogan people might actually believe. Of course we have to trade with China, and it is going to be especially vital for the City of London, but do we have to be quite so shameless and pathetic about it? Osborne is the architect of the UK’s China policy, and has made sure that everyone knows it. Now, the optics of this state visit, as viewed on television news, look increasingly like a national humiliation. It’s hard to disagree with that assessment, and to feel a mounting sense of shame at Britain’s determinedly mercantilist foreign policy. It may reap financial and political rewards, but craven spectacles such as this gravely undermine Britain’s role as a world leader. It is all the more galling because it is so unnecessary. No disrespect intended to Spain’s westward neighbour, but Britain is not Portugal. We are not, thankfully, some middle-ranking economic and military power. Our armed forces may be worryingly pared back and our workforce’s productivity frustratingly low, but Britain is still one of the few indispensable nations. Though we have been introspective and full of self doubt of late, our fundamentals – world leading firms, popular culture, arts and music, legal system and democracy – are among the most popular and most envied in the world. None of this is to say that we should not have welcomed Xi Jinping to Britain – we are right to do so. It is absolutely in our interests to forge and maintain good diplomatic relations with China. But we should not allow ourselves to be seduced or intimidated by China’s new economic and geopolitical clout. 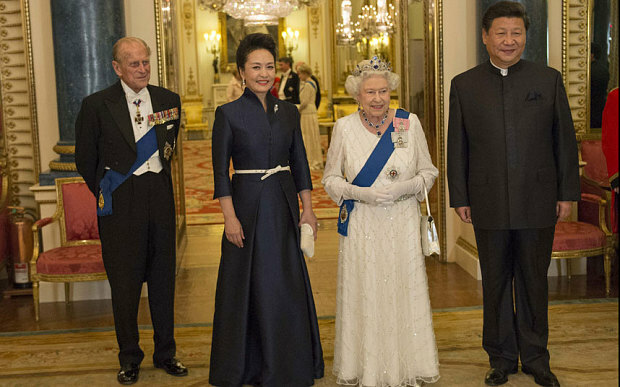 Continued Chinese growth – and the ongoing stability of their autocratic, dictatorial regime – depends on maintaining friendly relationships with key countries like Britain. Neither country can much afford to freeze the other out for the long term. The problem is not the Chinese – it’s us. It is the attitude of some of our politicians and their friends in the media, who seem too eager to buy into the pessimistic narrative of British decline and waning relevance. Listening to some of them, one would almost think that we were back in the dark, pre-Thatcher days of the 1970s all over again. 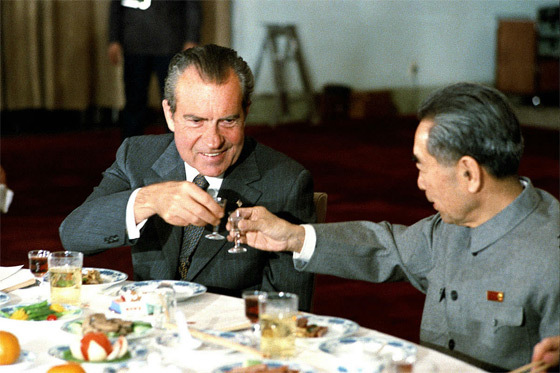 Back in 1972, when Britain truly was floundering in the economic doldrums, riven by industrial strife and a failed post-war consensus while the United States grappled with problems of their own, President Richard Nixon travelled to Beijing to “reset” America’s relations with China in far more tense and unpredictable circumstances than those which bring Xi Jinping to London this week. As a general rule, it’s best to avoid the examples set by Richard Nixon and Henry Kissinger. But on this one particular occasion, our political and media class might take a useful lesson in terms of how they conduct themselves.